Dr Katarina Mikac works in an area of science with a fantastic name - Invasion Genetics. Invasion Genetics is an area of molecular ecology. Molecular ecology is the study of how organisms interact with their environment from a molecular point of view - that is, it examines the roles of DNA and genetics in how species adapt to their environments. It's also part of the larger field of evolutionary biology which looks at the origins of species and how they evolve over time. Specifically, invasion genetics tracks the movements of invasive species using their DNA - you can't put tracking devices on insects! One of Katarina's research areas is the Khapra bettle - the world's most destructive seed-eating pest. The beetle feeds on grain and seed kernels, and can decimate storage systems. In fact, heavy infestations can destroy thousands of kilos of stored grain in a matter of weeks. However, it is not present in Australia and this is where Katarina comes in. Australia plays host to the khapra's sister species, from which it is virtually indistinguishable, but by using DNA fingerprinting, Katarina is aiming to develop a species identification test which could identify the beetle at airports and stop it from coming into the country. Another aim is to investigate the sister beetle's genetic diversity and gene flow in order to understand its distribution and movement patterns. This will lead to better understanding of the consequences of the inadvertent introduction of the khapra beetle. Katarina's current work is on the population genetics of the invasive Western Corn Rootworm which destroys corn if left untreated. In the United States, it is estimated that 30 million acres of corn (out of 80 million grown) are infested andvthat Corn Rootworms cause $1 billion in lost revenue each year. In 2007, Katarina won the 2007 Science and Innovation Award for Young People in Agriculture, Fisheries and Forestry for her work on the Khapra bettle and is just about to leave our shores for a series of conferences in Germany and Croatia on the Western Corn Rootworm - good luck Kata! With Easter coming up and all sorts of religiosity going on, here are a couple of heavenly photos from space. 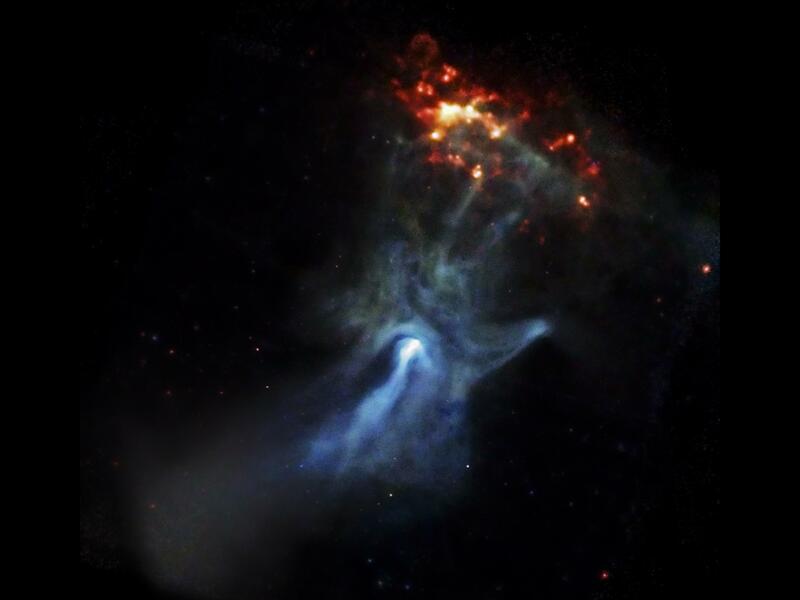 The first, looking spookily like a hand, comes from the Chandra X-ray Observatory. At the centre of this image is a very young and powerful pulsar, known as PSR B1509-58. The pulsar is a rapidly spinning neutron star which is spewing out energy to create the shapes we see in this photo, including the one that resembles a large blue hand. In this image, the lowest energy X-rays are red, the medium range is green, and the most energetic are blue. The pulsar is only around 20 kilometres in diameter but the nebula spans 150 light years. For more amazing photos from Chandra, check out their flickr gallery. This image came out on April 3 2009. The second is one you may have seen before - perhaps in a spam email. It has been dubbed The Eye of God and was featured on NASA's Astronomy Picture of the Day in 2003. 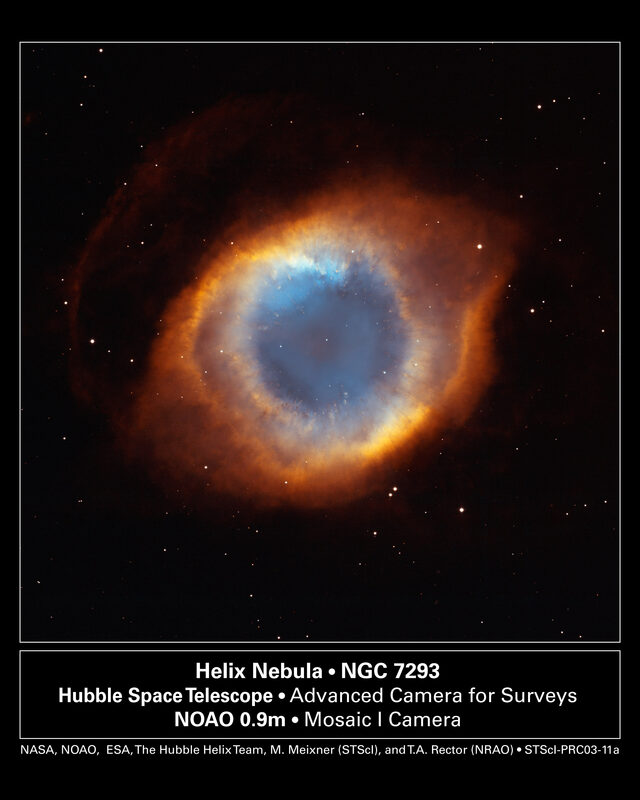 It is the Helix Nebula, which is a planetary nebula created at the end of the life of a Sun-like star. Gasses are expelled into space to make it look like we are looking down a helix. The remaining core glows so much so that it causes the previously expelled gas to fluoresce. It seems God has blue eyes and a lot of redness around the outside, suggesting he stayed out a little too long the previous night.